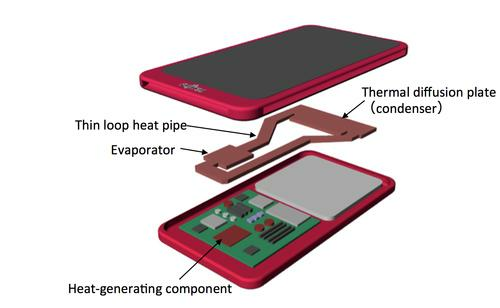 An illustration of how Fujitsu's thin heat pipe could be used in smartphones, helping to keep them cool. Fujitsu Laboratories created a heat pipe in the form of a loop that's less than 1mm thick. The device can transfer about 20W, about five times more heat than current thin heat pipes or thermal materials, the company said. The technology could improve smartphones' performance by helping cool their CPUs and other heat-producing components, spreading that heat more evenly across other parts of the phone. Overheating has been an issue with some Samsung Galaxy smartphones, and the Korean manufacturer apparently dropped Qualcomm's Snapdragon 810 processor from the Galaxy S6 due to excessive heat concerns. While heat pipes have been used in laptops, they are uncommon in smartphones, where sheets of metal or graphite have been used instead. Fujitsu said its pipe is the first of its kind under 1 mm thick that can be used in thin electronic devices. The pipe consists of a stack of 0.1mm-thick copper sheets containing channels through which water circulates by capillary action, meaning it will work regardless of a smartphone's orientation. One part of the heat pipe sits over a heat source such as a CPU, which evaporates the water. Another part, a thermal diffusion plate, acts as a condenser, turning the vapor back into liquid and returning it to the evaporator part. While the heat pipe doesn't remove the heat from the smartphone, it might limit overheating in particular areas by spreading heat around and reducing the temperature of the hottest spots. "For current smartphones, we predict the surface temperature to be reduced by several degrees, although this will vary depending on a variety of factors such as the internal structure of the smartphone," a Fujitsu spokesman said via email. The heat pipe could also reduce the frequency of automatic restrictions that smartphone CPUs apply when temperature is expected to rise, the spokesman added, meaning CPUs could work unhindered more often. Fujitsu aims to commercialize the technology, which can be customized for different mobile device designs, by early 2018. It's also looking into uses in communications, medical and wearable devices. Meanwhile, it plans to present the work at the Semiconductor Thermal Measurement and Management Symposium (SEMI-THERM) in California next week.